Restaurants in Florida have added an Obamacare surcharge to pay for employees' health insurance. Several restaurants in a Florida chain are asking customers to help foot the bill for Obamacare. Diners at eight Gator's Dockside casual eateries are finding a 1% Affordable Care Act surcharge on their tabs, which comes to 15 cents on a typical $15 lunch tab. Signs on the door and at tables alert diners to the fee, which is also listed separately on the bill. The Gator Group's full-time hourly employees won't actually receive health insurance until December. But the company said it implemented the surcharge now because of the compliance costs it's facing ahead of the Affordable Care Act's employer mandate kicking in in 2015. "The costs associated with ACA compliance could ultimately close our doors," the sign reads. 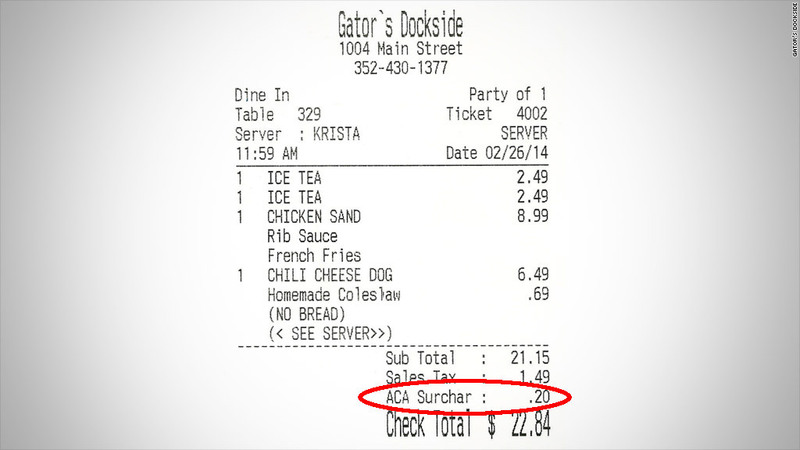 "Instead of raising prices on our products to generate the additional revenue needed to cover the costs of ACA compliance, certain Gator's Dockside locations have implemented a 1% surcharge on all food and beverage purchases only." The company employs a total of 500 people, with about half working full-time. Currently only management receives health benefits, but the restaurant will have to offer coverage to all full-timers once the mandate takes effect. The fee will allow the company to continue offering full-time hours to many workers, according to Sandra Clark, the group's director of operations. "I'm just trying to keep the employees I have that I've worked hard to train," Clark said. In addition to the costs of providing health care, the company hired one additional staffer and a consulting firm to make sure it is complying with the law and to assist in the additional tracking of workers' hours and wages required by Obamacare, said Clark. Thirteen other Gator's Dockside restaurants, which are run by a different firm and its franchisees, are not implementing the fee. Meanwhile, in Los Angeles, an upscale restaurant is also asking guests to pony up for its employee health care costs. Since it opened in November, Republique's tab comes with an optional 3% surcharge that allows it to employ all of its 80 workers full-time and provide them with health insurance. The fee is explained in a sign and on the menu, and servers explain it to diners without prompting. The surcharge is not related to Obamacare, a restaurant spokeswoman said. The eatery is not subject to the employer mandate until 2016 because it has fewer than 100 workers, but it already offers coverage to its staff. How are customers reacting to the fee? So far, most people are paying it, she said.